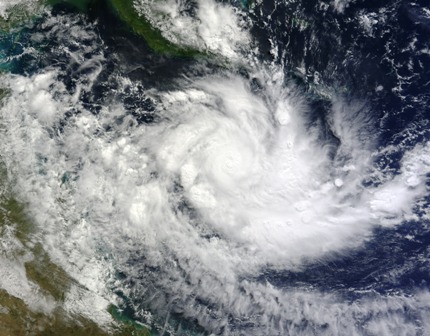 What is a tropical cyclone and what to do to stay safe? 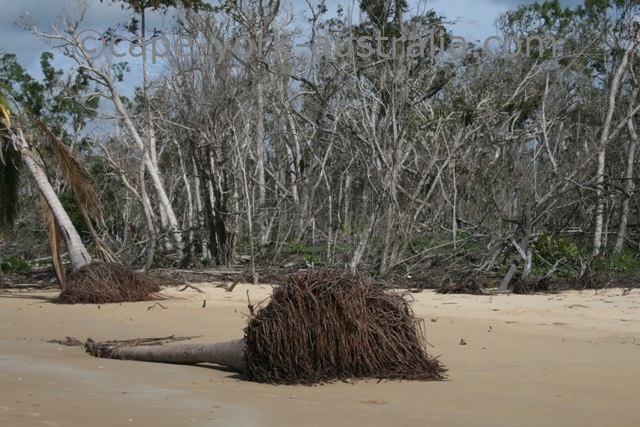 During the Wet Season in the tropics we are all threatened by destructive cyclones that can hit the coast. Due to the direction in which the Earth rotates, in the big picture they move from east to west, and so they often hit the eastern coasts of continents. Locally, though, they can change direction and move in any direction for a little while. It is important to be aware of what they are and how to protect your life and your property. 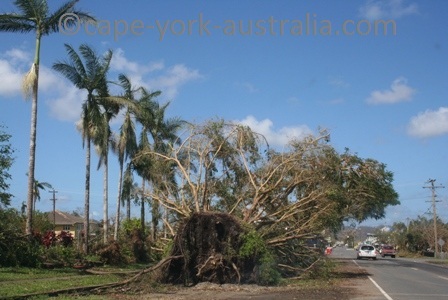 A tropical cyclone is a powerful, rotating wind system that forms above warm ocean waters during the hottest time of the year, and has destructive winds rotating around a calm eye in the centre. It doesn't mean much until it hits the coast and threatens life and property. A tropical low pressure system, which is always the start of a cyclone, will become a cyclone once its winds reach 100 km/h. Cat one is 100-124 km/h, cat two is 125-164 km/h, cat three is 165-224km/h, cat four is 225-279 km/h and cat five is more than 280 km/h. A tropical cyclone and a hurricane are basically the same thing. The small differences include that being in the Northern Hemisphere hurricanes have the opposite wind direction; and that due to the differences in categorising the power of a hurricane equals a 'severe' tropical cyclone. However a cyclone and a tornado are two entirely different things. While a tornado also is a violent system of rotating winds just like a cyclone, a tornado is smaller (area-wise) and usually a lot stronger; and as opposed to tropical cyclones it forms above the land, and it comes from thunderstorms. Tropical cyclones form above the ocean waters not cooler than 26 degrees Celcius. That means they form in northern Australia, and during the warmer part of the year. The season is November to April (included), and yes you can prepare before the season starts. 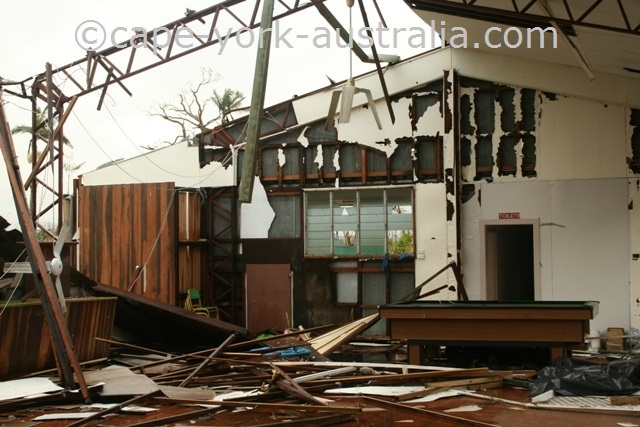 If a cyclone is likely to affect an area within 48 hours, that area gets what is called cyclone watch, which is updated every six hours and gives information about the cyclone's location, movement and strength. If 24 hours is left, you get the more serious cyclone warnings. 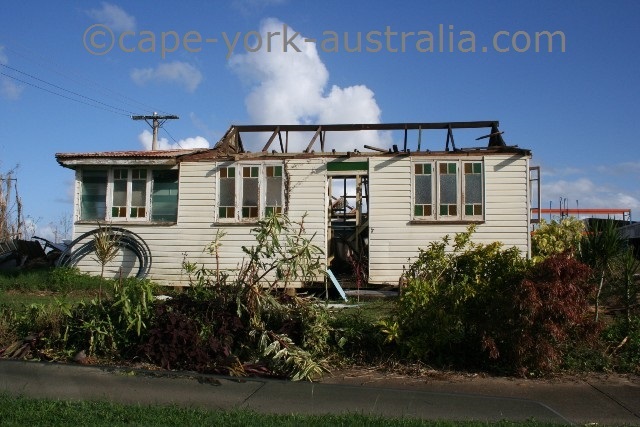 When you get the cyclone warnings it is the high time to clean your yard, tape your windows, secure your car, boat, caravan, and important documents. 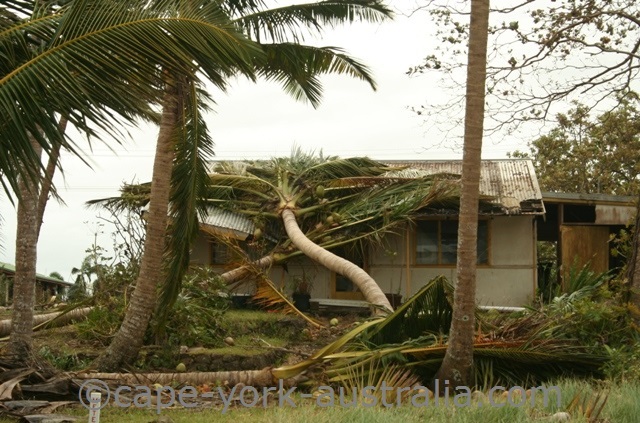 If you are travelling and a cyclone is coming, get out of the area, or discuss what to do with your accommodation provider. Within the last 24 hours you also have to decide whether you stay or leave. 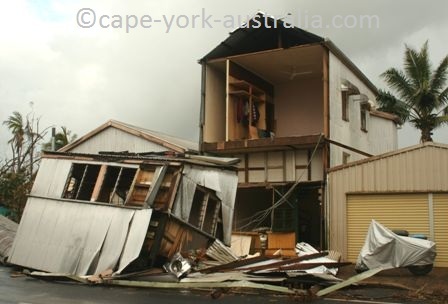 If you stay at home you stay in the safest room, but if you don't feel safe at home and particularly if you live in flooding or storm surge area, you should evacuate either to a different place, or to a cyclone shelter. Whether you stay at home or evacuate, you also prepare a cyclone kit. 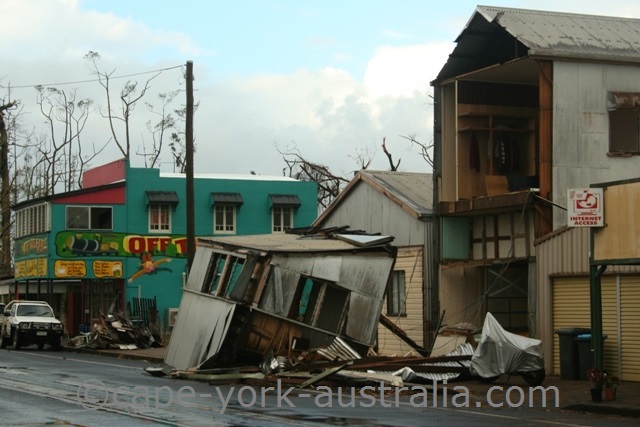 If you stay at home, it means having the things prepared and handy, if you evacuate you bring the kit with you, and the contents can differ depending on whether you evacuate to a cyclone shelter or stay in accommodation or at friends and relatives. 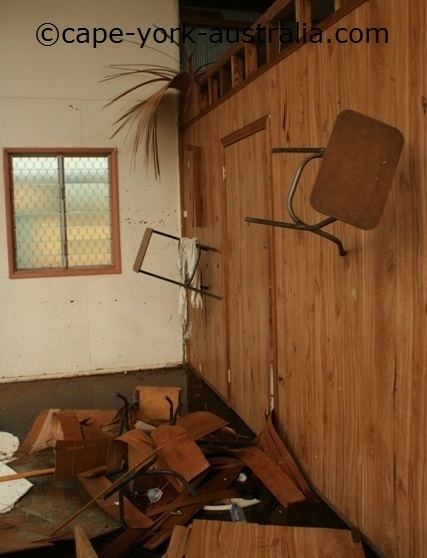 And yes you do also have to know about the aftermath. It can be dangerous, and there are also things that you will have to prepare. 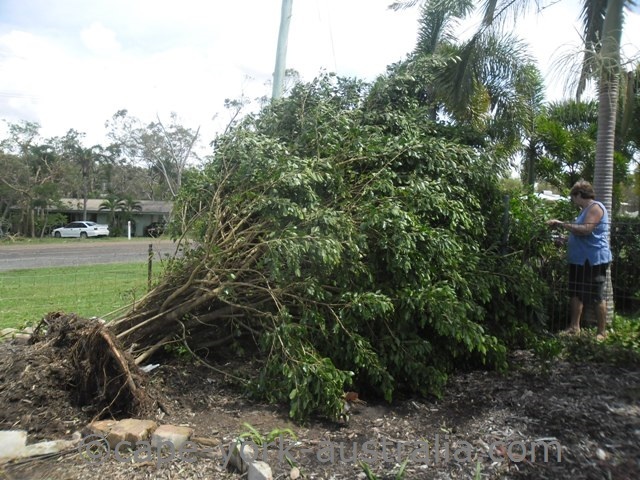 In the early aftermath you have to watch out for hanging branches and power lines, then you have the post cyclone cleaning, and most likely you have no power and no water supply. Where Do they Hit and How Strong Are they? 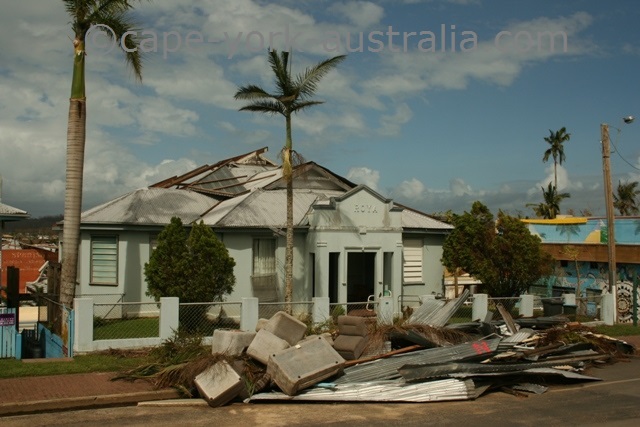 In Australia, the most cyclone-hit areas are the coasts of north Queensland, Northern Territory and the Kimberley in Western Australia, however an occasional cyclone may head as far south as towards Brisbane or Perth (in which case they often weaken due to cooler waters). A tropical cyclone gets its power from hot ocean water, and once it hits the coast and crosses the land, it dies off as it continues moving across the continent. 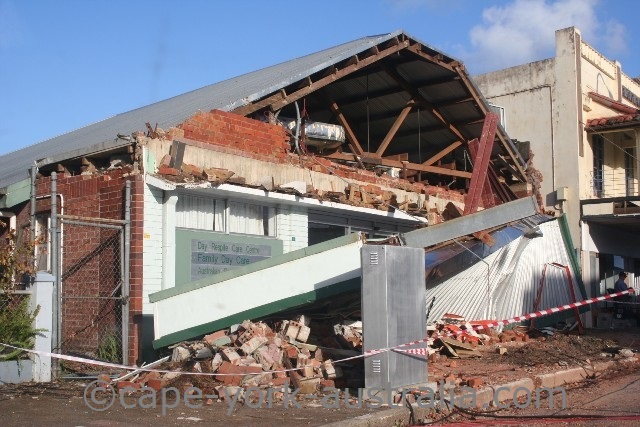 Thus, it is most destructive on the coast, and once it crosses the inland it doesn't do that much wind damage but it does bring very heavy rain for a long time, sometimes weeks, and can cause floods where it crosses the inland. 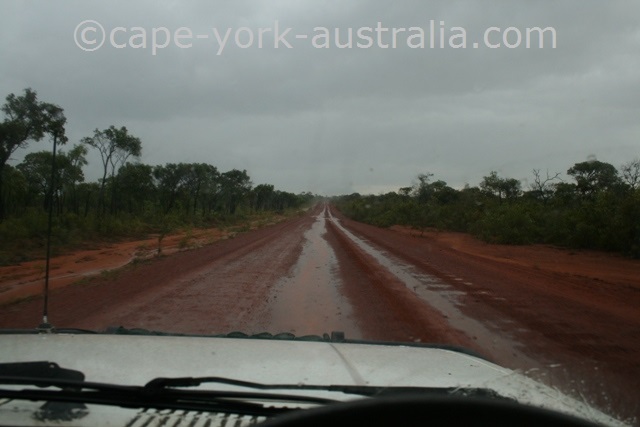 It sometimes crosses narrower land, Cape York peninsula is a very good example, and comes out to the water again. If it is still a tropical low (i. e. hasn't died off proplerly) when it comes out to the water again, it may reform to a cyclone. There is a scale from one to five that gives a tropical cyclone a category number depending on the strength of its winds (the scale of American hurricanes is also one to five but the wind strength for each category is somewhat different). 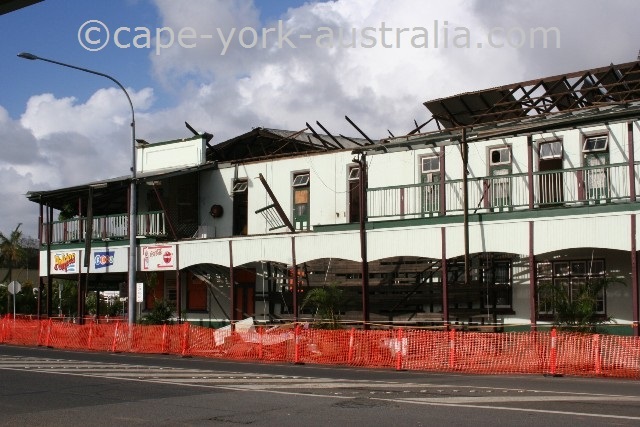 The impact that a tropical cyclone does, does of course not only depend on the category but also where it hits and what kind of buildings are there. 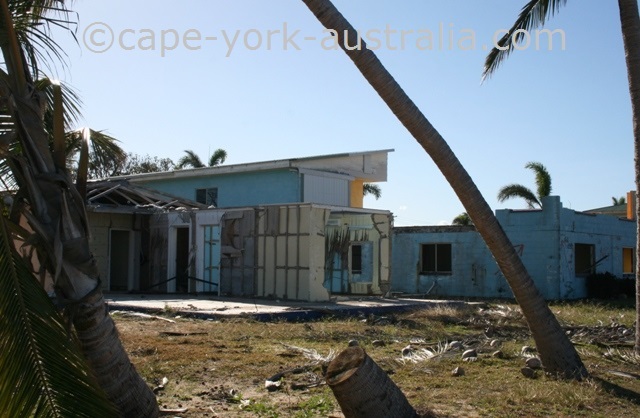 While nowadays the buildings in northern Australia are built cyclone safe, there are also some remote areas that still take damage even from low-category cyclones. 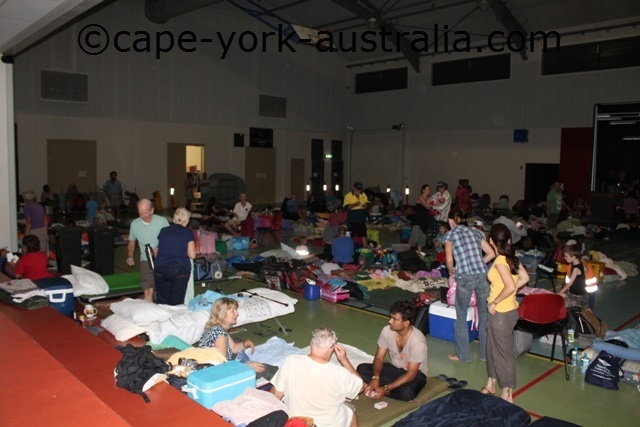 And if you are camping in the bush with no shelter, you are still very vulnerable even to a low category tropical cyclone. 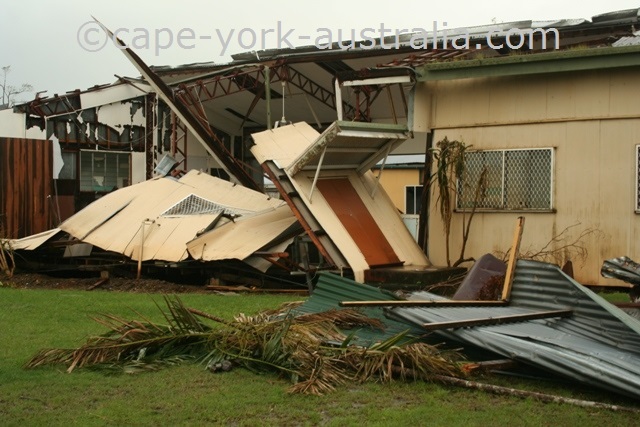 There are at least some tropical cyclones hitting Australia every year, and while most are low category (Oswald, Zane and Gillian having been some of the latest around Cape York), we have also had some cat fives only as recently as in 2006 (Larry) and 2011 (Yasi .. read more about cyclone names). 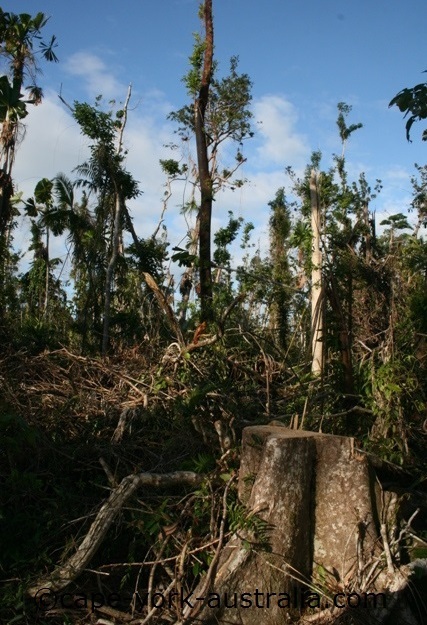 Both left behind extensive damage with a lot of buildings, including private homes damaged or totally demolished, as well as the landscapes totally changed from lush green rainforests to bare and broken tree skeletons. 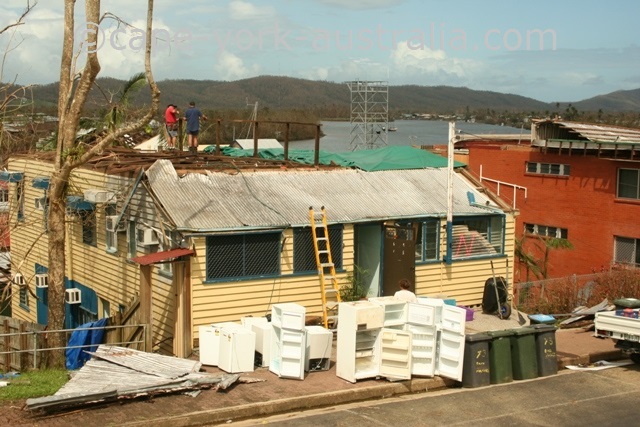 And the severe cyclone Ita in April 2014 was a Cat five, said stronger than Yasi, until it was downgraded right in the end of its path, saving our beautiful Cooktown and most likely our own roof. 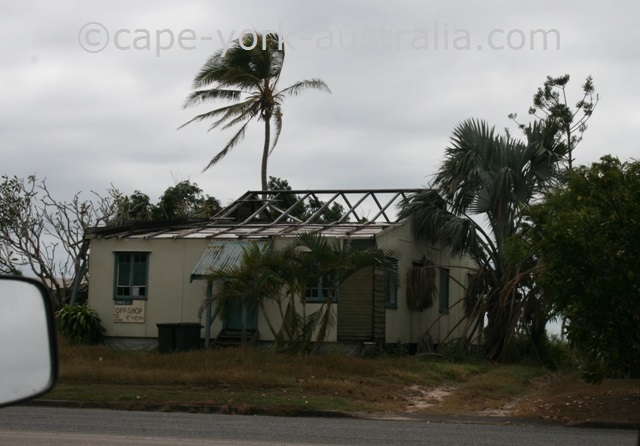 Only 11 months later, severe cyclone Nathan again threatened Cooktown, ending up crossing the land north of it as Cat four. 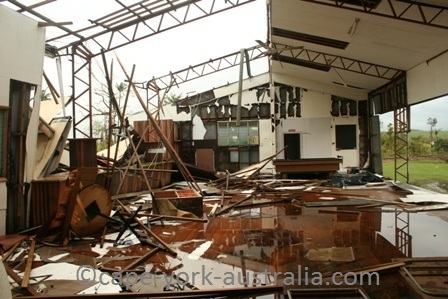 Cyclone destruction is an ugly sight - it totally looks like an atomic bomb went off (here is some more photos). 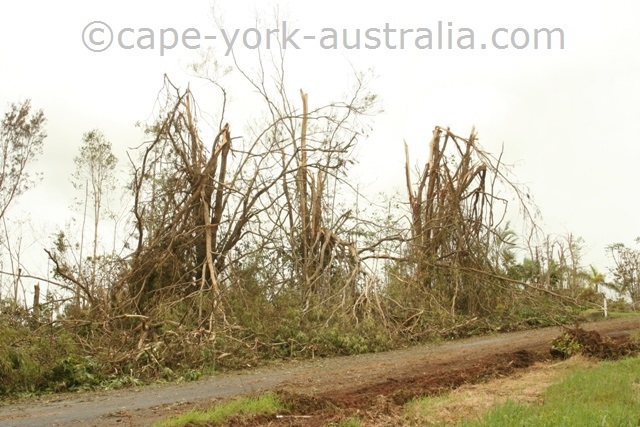 Severe cyclones are of course life threatening and the only reason why no lives were lost was good preparation. 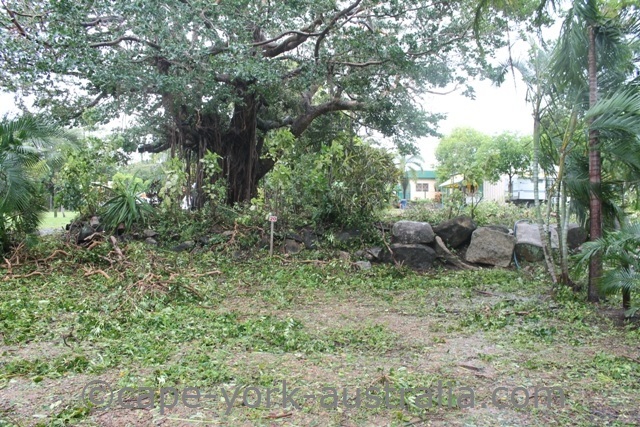 We locals do the pre-cyclone cleanup in the yard so minimal amount of debris is flying around. If it's a higher category cyclone, we tape an X across the windows to increase their strength. 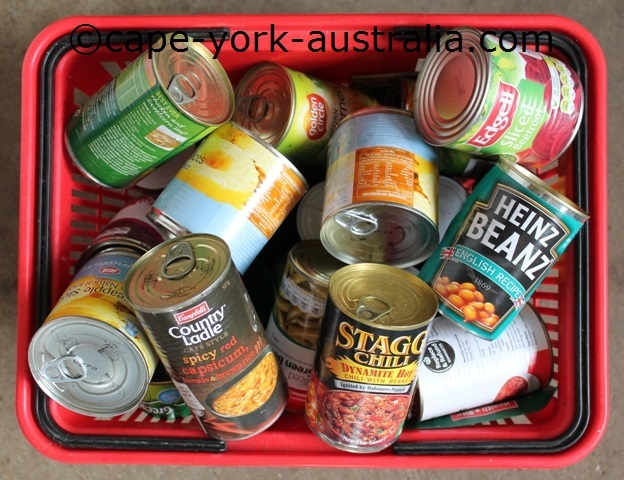 We stock up tin food because it lasts and the shops may be closed for a long time. It is also smart to stock up drinking water in case water supplies would be affected. There may be a period of time without power or phone lines in which case the only source of power will be generators and batteries, so we make sure we have them. And it's smart to get some cash out because if there is no power in town, ATMs and banks won't work either. 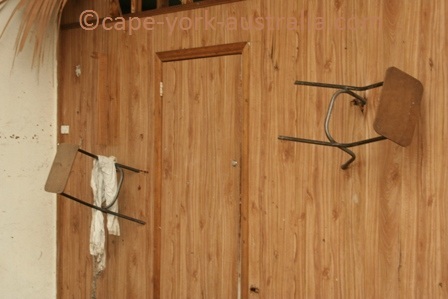 We either keep ourselves inside during the cyclone, or we evacuate. Inside the house it has to be a room with no windows - typically the bathroom. We learn from each cyclone. 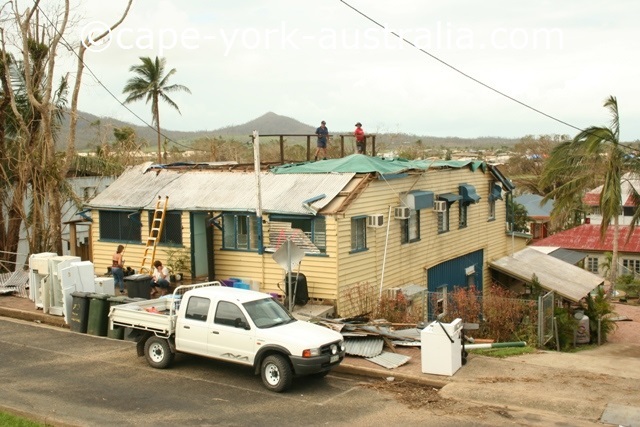 Once you have been through a cyclone sitting inside your house, you know whether you want to put yourself through the scary experience again or whether you choose to simply leave the place (which many did before Yasi, with memories from Larry in mind). 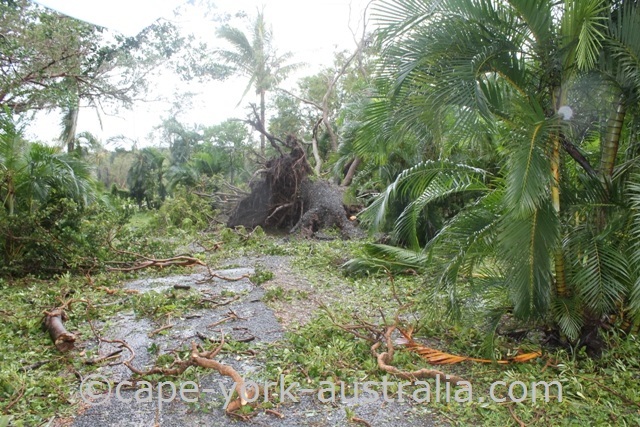 Cyclone definition - what is a tropical cyclone? It is a powerful system of very strong winds that rotate around a calm centre that is called the eye of the cyclone. The weather brought by the winds is always very rainy with grey skies, but in the eye there is very little wind and the skies are often clear. The diametre of the eye can be anything from 10 to 100 km but most often it is around 40-50. Around the eye is the so called eye wall, where the winds are the strongest. 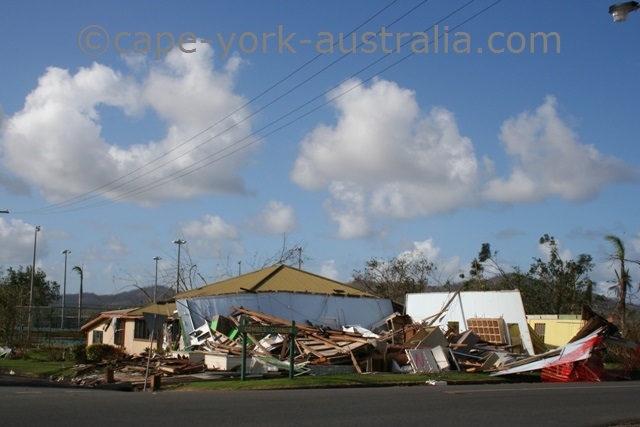 Further out the gale force winds can extend as far as hundreds of kilometres. 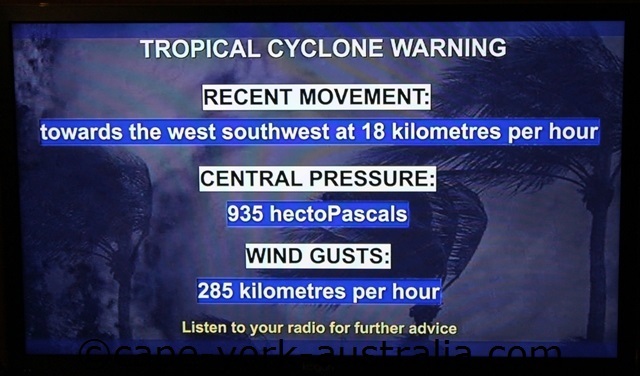 Cyclone warning is more serious than cyclone watch. 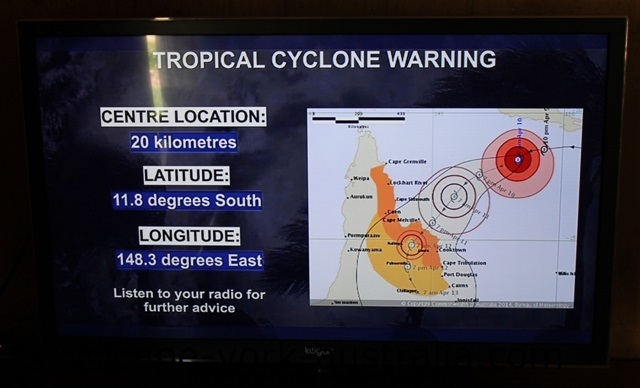 Once it is threatening your area and there is 24 hours left until the landfall, you get cyclone warnings through TV and radio. These are issued every three hours (and more often the closer it gets) and give you information about the cyclone, when it should hit, and what category it is predicted to be. It shows the map from the BOM website, along with where it formed, its current exact location, and its predicted path. It shows how strong winds it has, what pressure it has, and how quickly it is currently moving. 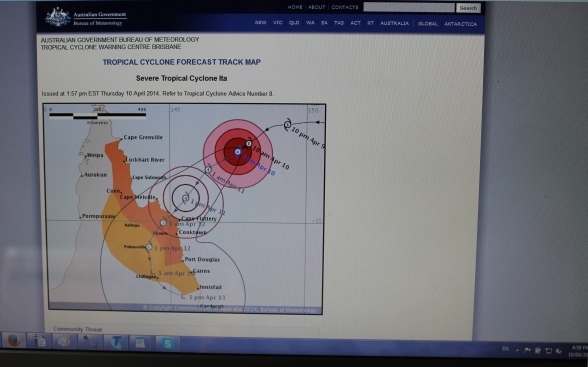 It shows the current category of the cyclone, and explains its predicted path. As opposed to cyclone watch, it also tells you about any forecasts of heavy rainfall, flooding and any possible storm surge. 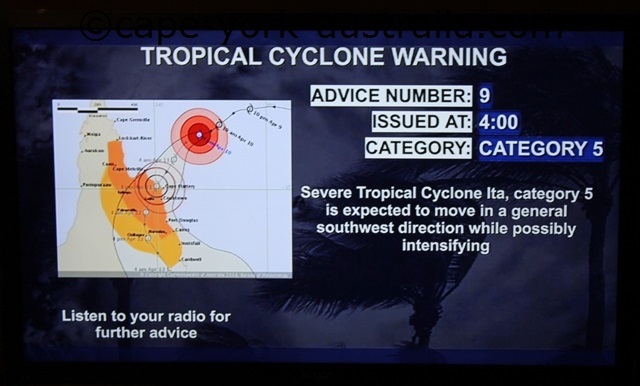 If you are getting cyclone warnings you should listen to your radio and start cyclone preparation as soon as possible. Cyclone watch is the first cyclone alert. 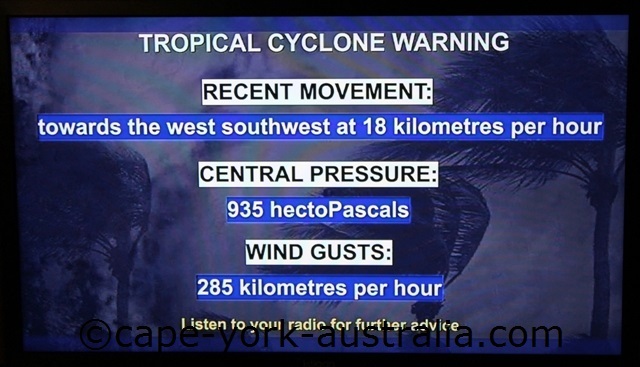 Twenty four hours before a cyclone hits your area, you will get cyclone warnings. But before that - 48 hours before it arrives - you are issued cyclone watch every six hours. It informs you about the cyclone's location, size and direction, but not much more at this stage. 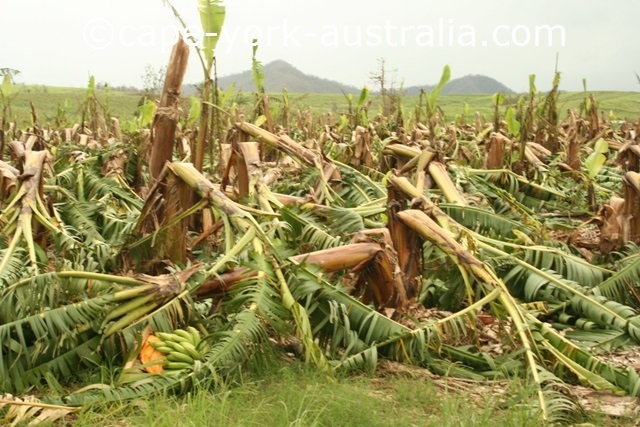 Regularly check TV and radio cyclone advice. Talk to your family members and make sure everyone knows what to do. Check so your neighbours are aware of the cyclone. 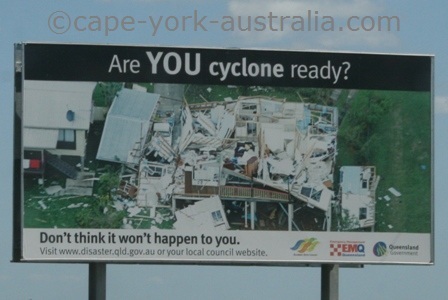 Start planning and getting into cyclone preparation, and also preparing the cyclone kit. 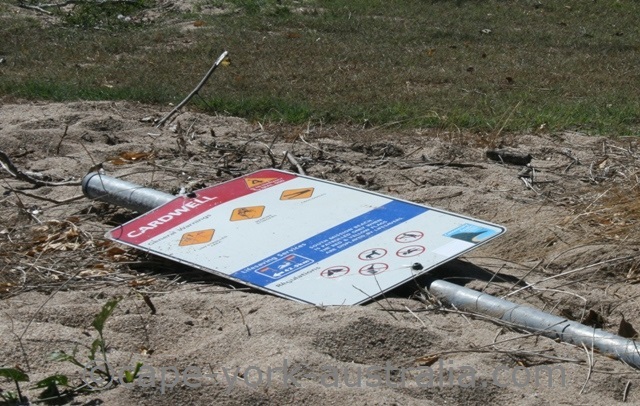 On this page you have the cyclone emergency evacuation procedures. 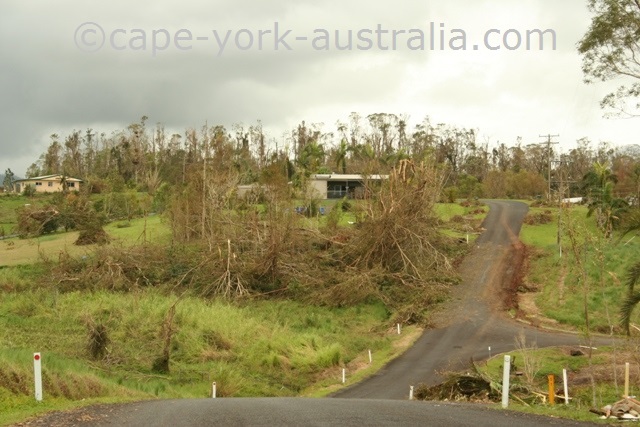 Like with bushfires and many other disasters, an important part of your cyclone preparation is to decide whether you stay at home or leave the place. You are usually only ordered to leave if you risk flooding or storm surge, but if you don't feel safe at home, of course it is your choice whether to leave. It is recommended you go to friends and relatives if possible, but if those are too far you can go to your closest cyclone shelter. You have turned off your power, gas and water, unplugged all appliances, and you keep listening to your battery operated radio. 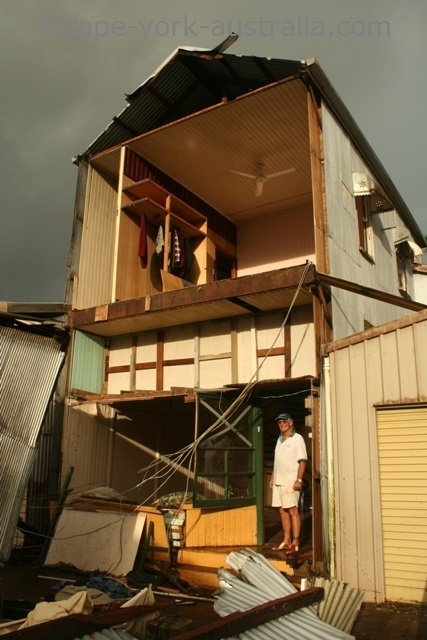 Shelter in the strongest part of your house - which in most cases is bathroom, toilet or hallway - a room with no windows. If your home starts breaking up, seek extra safety by sheltering under a table or bed, and using matresses and blankets for protection. Do not go out even during the calm eye - the winds that hit right after it come quickly and are the strongest winds. 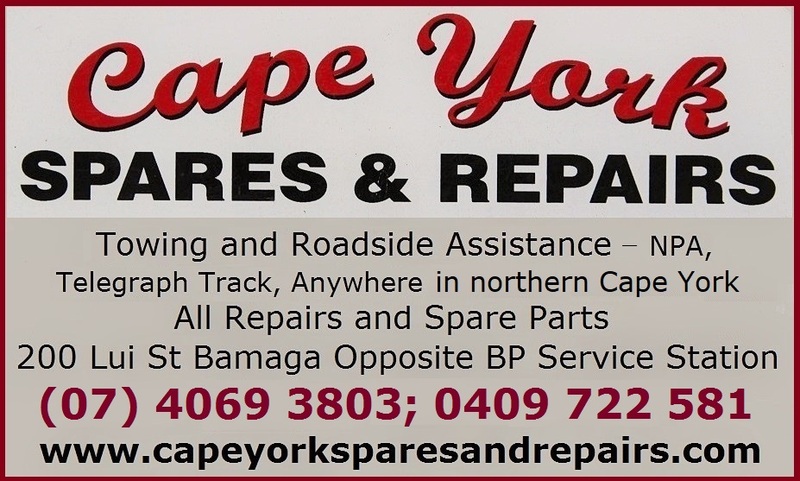 Have your cyclone kit handy. Unplug all appliances and turn off power, gas and water. 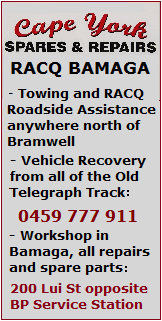 Make sure you have enough fuel and leave early enough to not to get caught in heavy traffic or strong winds. Use one car per family to avoid contributing to heavy traffic. Make sure all your family members wear suitable clothes and strong shoes. Bring your cyclone kit and clothes for sleeping. Bring your most important things - lap top, important documents, family photos and anything else you don't want to lose. Depending on where you are going to stay over night, you may have to bring bedding. 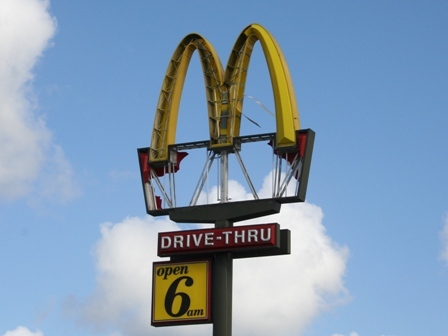 Depending on where you go, you may have to bring some food. But in any case do bring drinking water and enough of it. 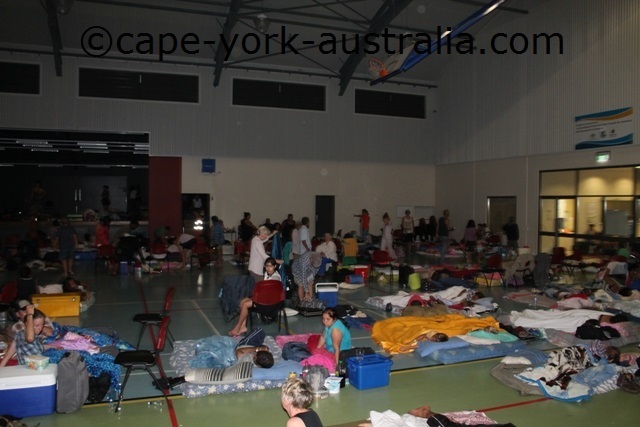 Make sure a cyclone shelter is activated or you may get there and it is closed. They do announce officially if they activate one. Make your mind up early, and go early enough to make sure you get in. 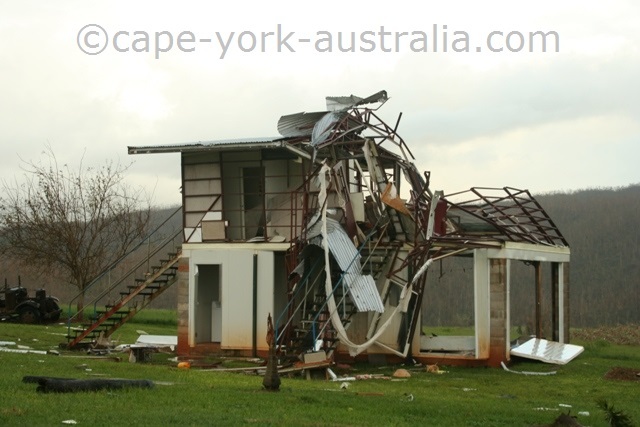 Cyclone shelters don't have endless space, and they can close early - once the winds reach 100km/h - to avoid the situation where people are out there in too strong winds. There is only so much parking space, so use one car per family. 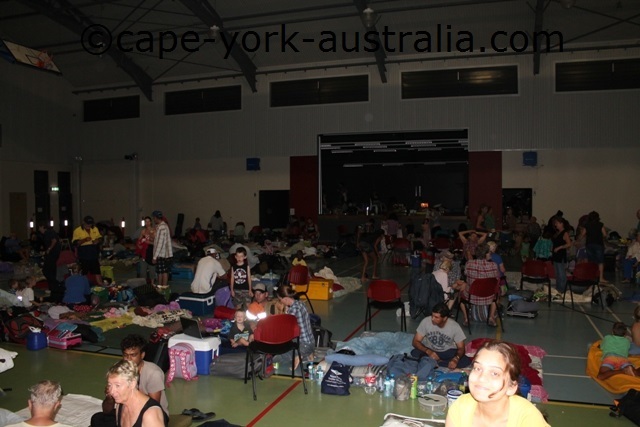 Cyclone shelters are not the most comfortable places to sleep. If you do have friends and relatives close enough consider them - it will be more fun and more comfortable. They don't allow you to bring unregistered pets or any alcohol. They don't provide any food - you have to bring that yourself and they do allow eskies. They do have a drinking water machine, but only until the water system still works! It will get broken in strong cyclones so do bring your own water bottle. And most importantly - to a shelter you do have to bring not only bedding (pillows and blankets) but also a matress or a camping bed - or else you are going to sleep on the hard floor! 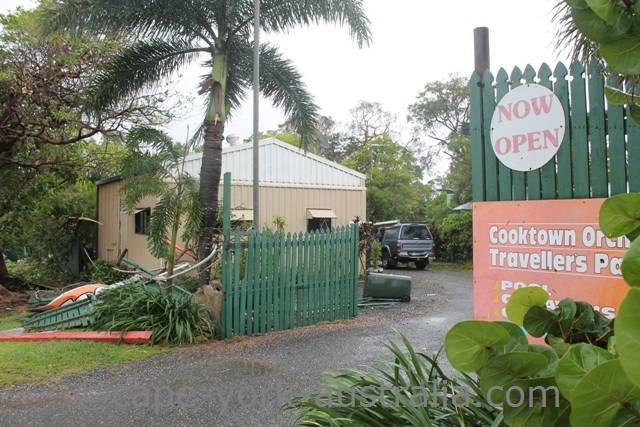 And all that said I am talking about the Cooktown shelter - some emergency evacuation procedures in some other shelters may be different. 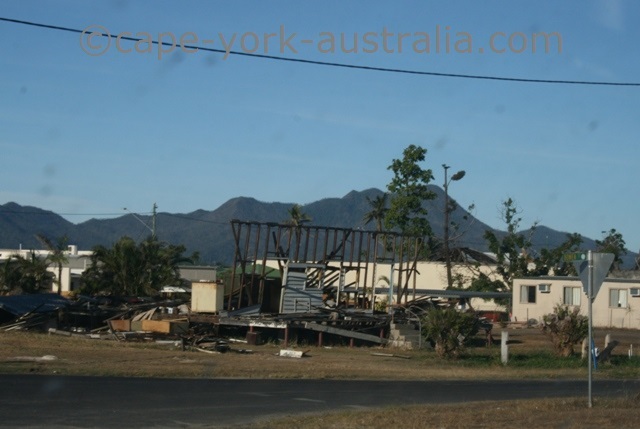 So what is the cyclone impact for you as a traveller? 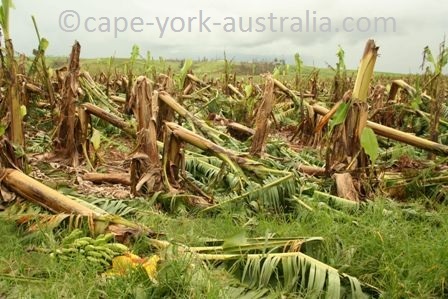 We all know that tropical cyclones cause a lot of wind damage, destroy property, tropical rainforests and flatten banana fields, but what is the impact for you as a traveller? 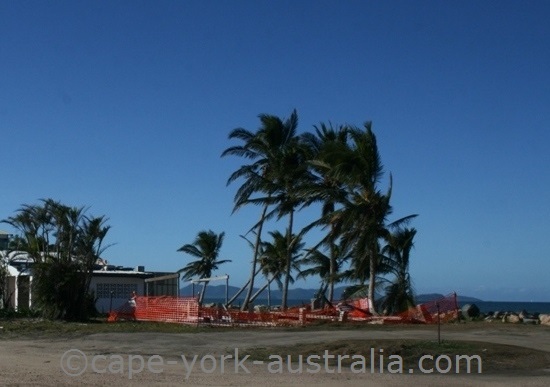 If there is a tropical cyclone up north, will north Queensland close down? And how long will it take before you will be able to travel up here? 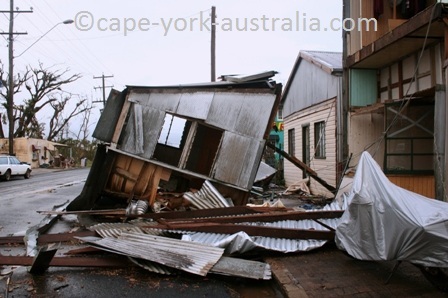 Well a tropical cyclone has two main kinds of impact. 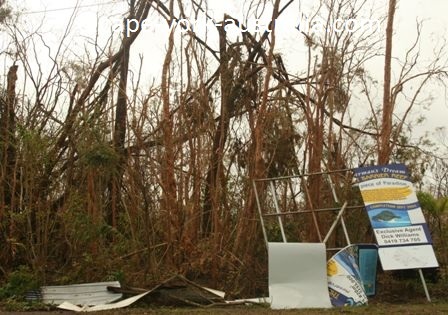 The first is the wind destruction and damage. 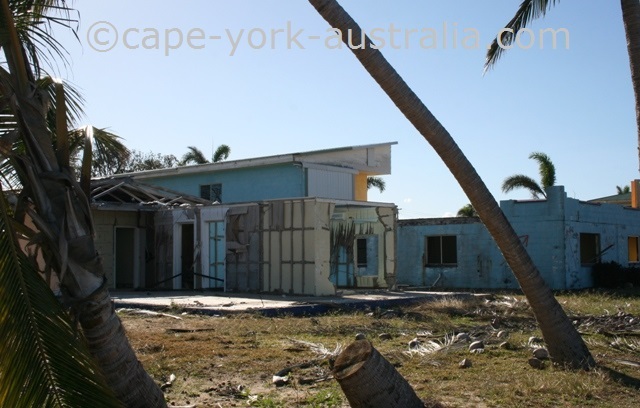 That mostly happens with high category cyclones, but if it's a remote area, where the buildings are not always cyclone proof, low category cyclones can cause damage too. 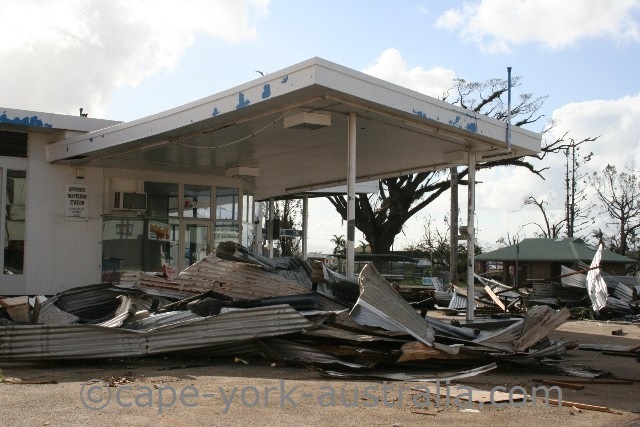 That damage can be devastating for locals, but does not make much difference for you as a traveller (provided, of course, that you are in a safe place yourself!). 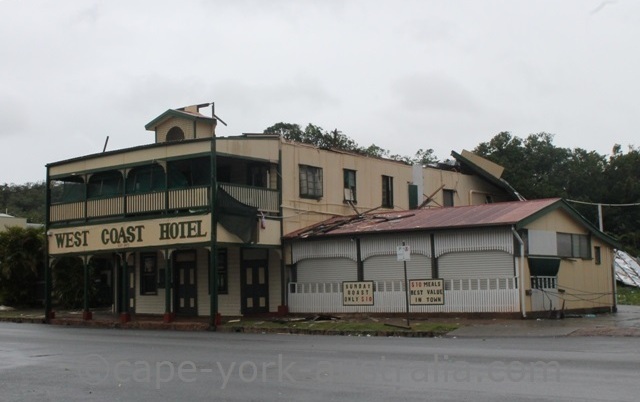 Any broken power and phone lines are usually fixed within days, and as soon as the power is back, the businesses reopen, and the life returns to normal.It is a quick rise of coastal ocean water, due to a low pressure system - often a tropical cyclone. Storm surge happens because out on the ocean the low pressure system and the strong winds are pushing on the surface of the ocean, so as the cyclone is coming towards the coast, the rise can come to the coast and the water can come over low lying areas. 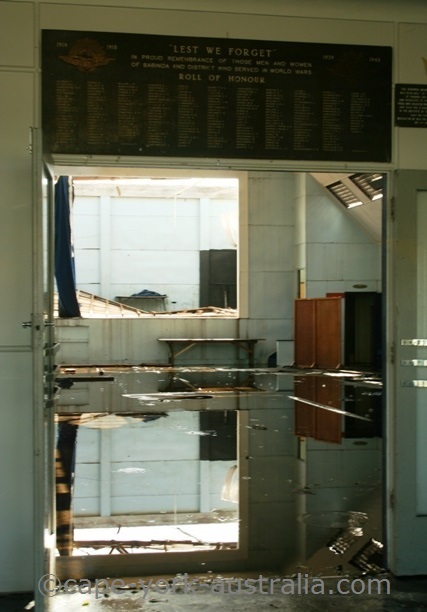 A bit like a tsunami, the water can move in quickly and cause serious damage to the coastal buildings. All tropical cyclones cause a storm surge, but not all are dangerous. 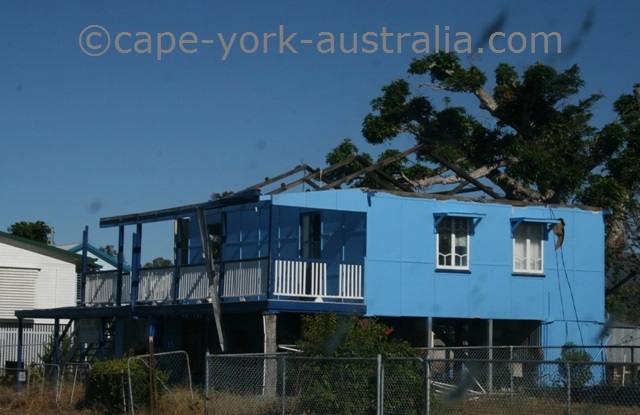 Obviously the stronger the cyclone winds, the higher and more damaging can be the surge. The quicker the cyclone moves to the coast, the higher is the surge. And if it coincides with high tide that also makes it a lot worse. And some other local factors that affect it include the shape of the sea floor, the shape of the headlands and bays, and the angle at which the tropical cyclone is approaching the coast. 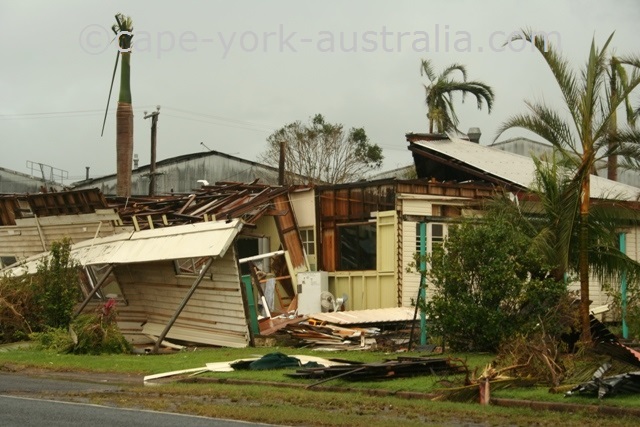 But apart from the destruction, and no matter how strong a cyclone is, it always brings some rain with it, and often a lot of it. 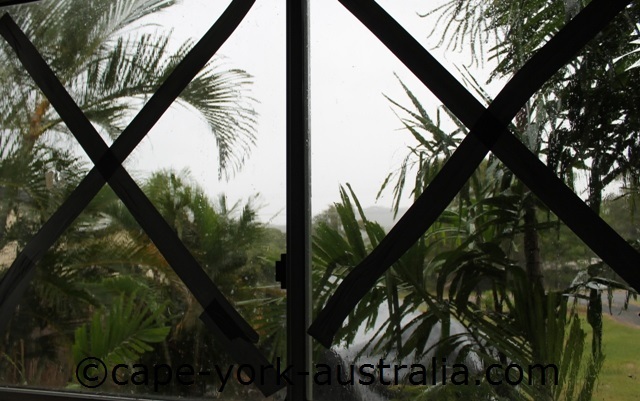 The rains start during the cyclone, sometimes even before, and can last for anything from a few days to a week, sometimes two, but that's about the most. 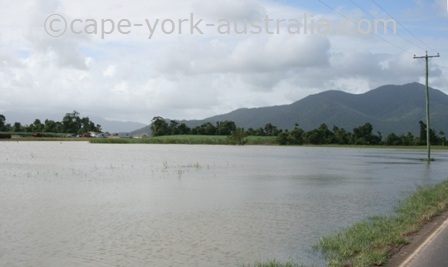 Will those rains cause floods in north Queensland? Well, while the rains last, locally they can. The river and creek waters do go up, some people can get flooded in if they are living on low laying land. 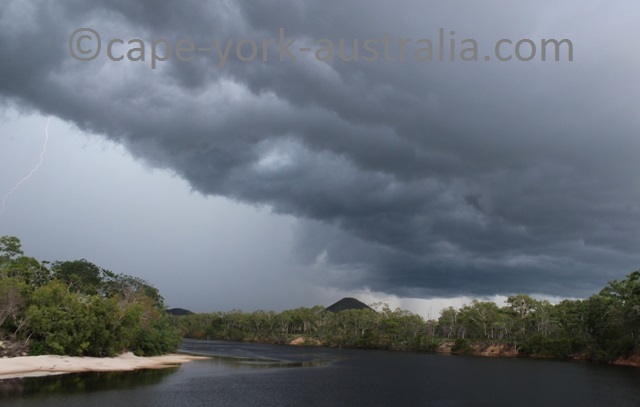 But what is the difference from south eastern Queensland - famously the ground for the 2010-11 floods (also the 2013 floods brought by Cyclone Oswald) - is that our floods don't last much longer than the rains. We are on higher grounds, our ground is not as flood prone. 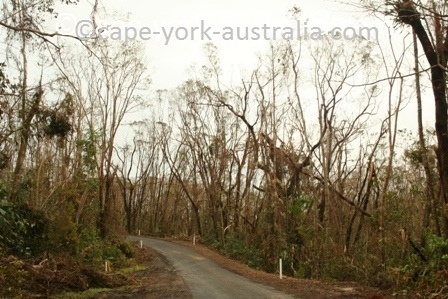 Once the cyclone rains are gone, the creeks and rivers go down quite quickly, and pretty soon the cyclone impact is gone. 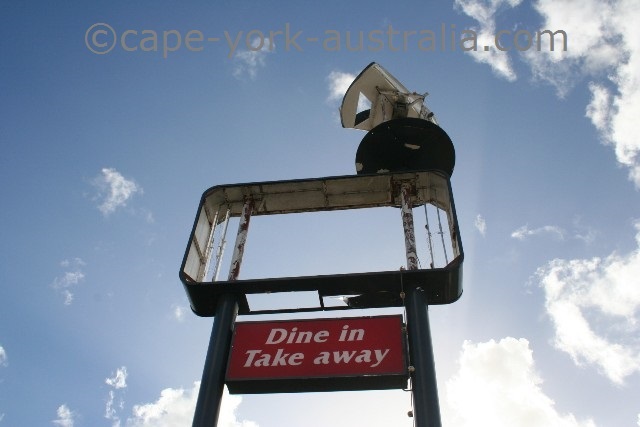 Is Cape York any different? Well only when it comes to the fact that the roads are unsealed and obviously get more boggy and slippery. When it comes to how quickly the rivers and creeks go down, it can be the matter of hours after the rain stops (depending on how long and heavy it was). 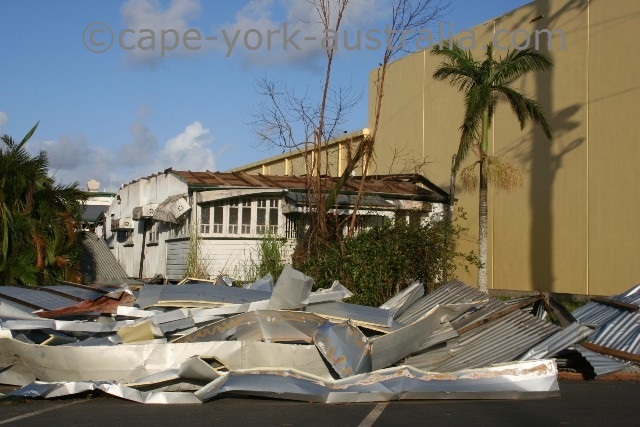 So even if Cyclone Zane did hit the coast, its impact would not have lasted to June or July - not even the second half of May in fact (2013). 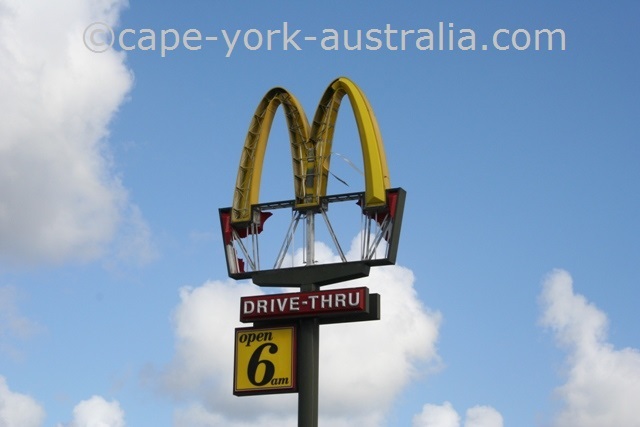 Cyclone Coming and You Are Travelling? 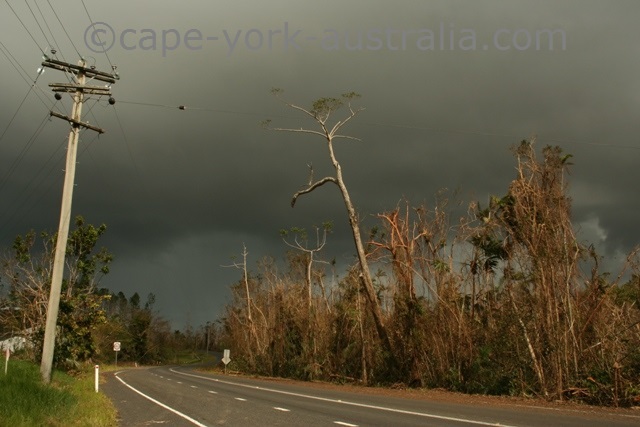 Here is what to do if you are travelling and there is a cyclone coming. 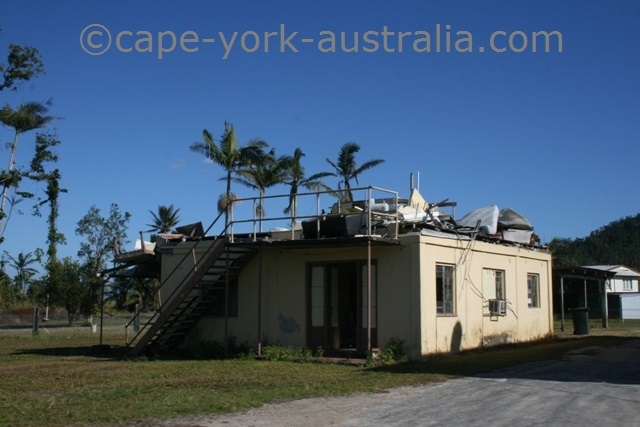 If you are in northern Australia, including Cape York, during the cyclone season, you have to follow the news and regularly check the BOM website to make sure you know in a good time if there is a tropical cyclone or a tropical low forming on the ocean near you. Have wireless internet and a battery operated radio (and have spare batteries) so that you can keep up with news even if the power went off. 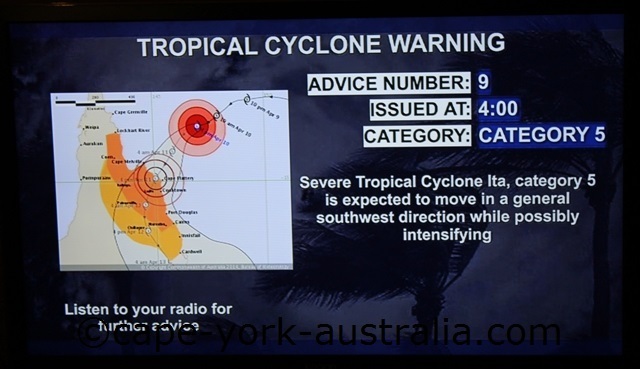 If a tropical cyclone is anywhere in the Australian waters, you will first know about it from the the BOM website and then the news. 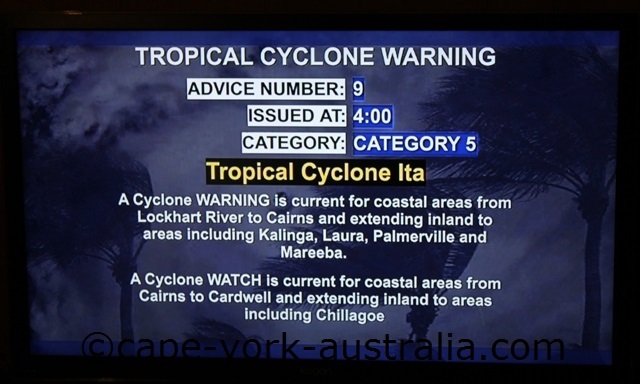 If there is a cyclone coming to your area you are issued cyclone watch, and once it hits within 24 hours you get cyclone warnings. 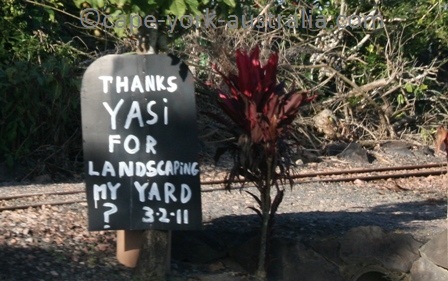 Also wherever you are, talk to the locals and see what they are doing. 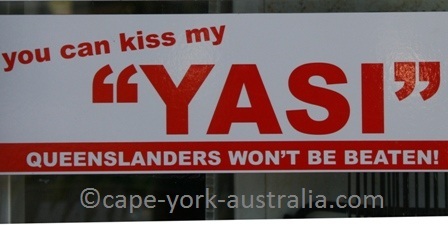 If you are staying in accommdation or a caravan park - talk to the manager or owner about what to do - they are locals and they know. If you are in an accommodation and get the order to evacuate (due to flooding or storm surge), again talk to your accommodation manager. 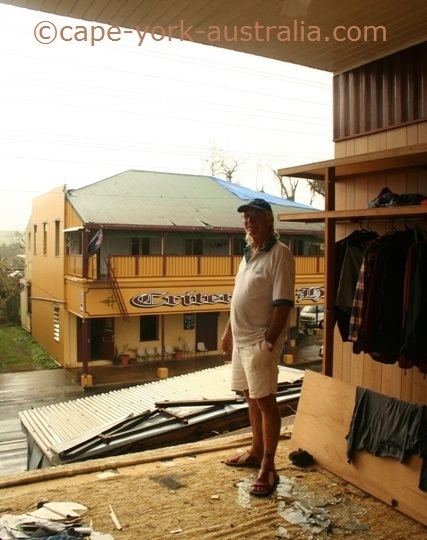 There are cyclone shelters in many towns and communities where people take shelter during the cyclone. This is not a smart season to go bush camping - but luckily the Wet Season with rains, floods and road closures stops most people from doing it anyway. 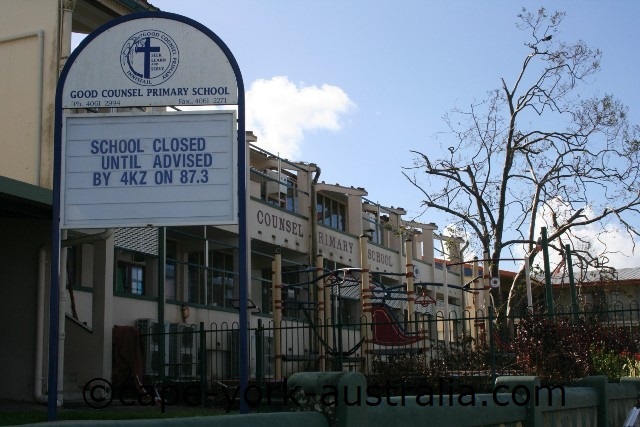 On this page you have a little cyclone photo album. Most of the photos are of Larry (2006) and Yasi (2011). 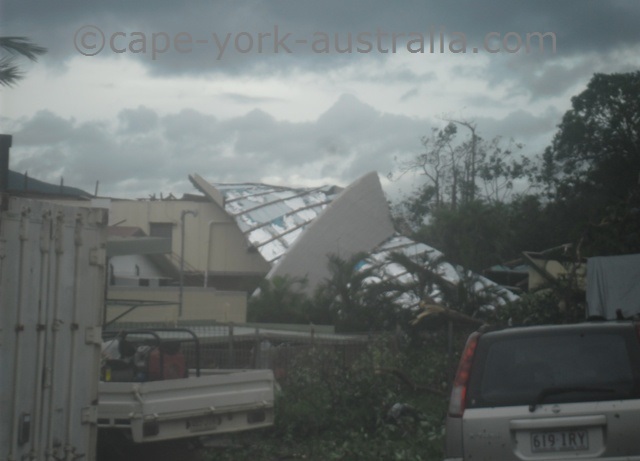 The first damaged the coast between Cairns in the north and Mission Beach in the south and the second between Mission Beach in the north and Townsville in the south.